More than two years after a pit bull was starved, stuffed into a trash bag and tossed down a garbage chute in a Newark, N.J. apartment building, his abuser has pleaded guilty to animal cruelty. Kisha Curtis, 29, was set to go on trial Wednesday. She was charged with animal cruelty in March 2011 after the dog was found near death. The pup was nicknamed Patrick because he was rescued just before St. Patrick's Day, and he has since thrived in recovery, where his story gained nationwide attention. Patrick captured headlines across the country when he was found abused, malnourished and near death. Today, he's happy and healthy under the supervision of a loving caretaker -- but his story is far from over. Tom Llamas reports. When Curtis is sentenced Aug. 29, a judge will determine Patrick's custody. The Essex County prosecutor's office says Curtis faces up to 18 months in prison, but a first-time offender is not likely to get jail time. 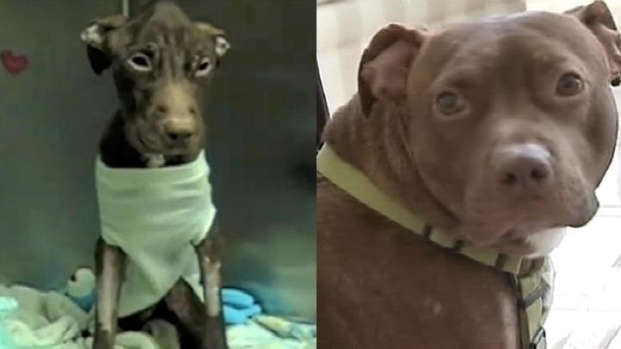 Patrick, the pit bull starved and stuffed into a trash bag, then shoved down a garbage chute in a Newark, N.J. apartment building, is a remarkably different dog nine months after his traumatic ordeal.